Episode 7 was great start to finish. One thing I've noticed with Joshiraku is that it has been very sparing with the physical comedy, but when it comes, they nail it. Great comic timing. A few weeks ago there was a scene when four of the girls were slammed into the wall, and the fifth went straight through the shōji. This week it was Kukuru's phenomenal table faceplant that cracked me up. Is it bad that I kind of want the ceiling to randomly cave in two or three episodes from now as a nod to the third part? Last edited by ThereminVox; 2012-08-28 at 20:30. Marii and others greets the new year on the stage. Gankyou, Tetra, kakuru, and Kigu talk about "Shin". Marii complains about "Su". They flatter Marii and cancel her dissatisfaction. It turned out that everybody has a prize of the new year congratulation from a master. The contents of these prizes are not known. Marii wants to choose one of those prizes first. However, the turn of selection of her becomes the last. Gankyou obtains 1000 yen, Kigu obtains 30000 yen, Kukuru obtains 2000 yen, and Tetra obtains the stock certificate of 600000 yen. From the sack containing the prize of Marii, there is sound of a coin. They tell Marii that it is good or bad various possibilities. Suddenly, recording of another version of the new year's greeting starts. However, "Su" and the sack containing a prize are taken from Marii by the person of a mask. They say a suitable thing and comfort Marii. AtoYokado = The parody of "ItoYokado" Department store. Shinsou kaiten, Shidai = Pachinko term. Shinookubo, Shinkawasaki = Name of a place. Surume = Dried shredded squid. snack consumed while drinking alcohol. Suukondero kono suttokodokkoi = Get out, "suttokodokkoi". "suttokodokkoi" is a contempt (the origin of a word is unknown) word. Tori = The last performer. The homonym of a bird(Tori). Otoshidama = Money which a blood relation and a relative give to a child in the New Year. Money is in a small envelope(Pochi Bukuro). This usually becomes 70 percent or more of children's incomes. Two charactors and five charactors = "Ya-su" and "Ku-me-ta-kou-ji"
2000 yen note = It was issued in 2000. However, since many of vending machines did not correspond to it, it is unpopular. Jyou = The unit indicating area. Number of sheets of Tatami. Once, the scooped-out 500 won coin was a habitual means of the small money income of South Koreans. person of a mask = VA Yuuki midori. Marii and others visits Sugamo. Marii has congratulately found out by old people and is raped. They talk about the goods currently sold at Sugamo. They visit a temple. Marii pours water on Gankyou. Gankyou deceives everybody to revenge. They eat dinner by Sugamo. Sugamo = The east of Ikebukuro. That is a town in which old people gather. Tukudani = It is the dish boiled down with sugar and soy sauce. hachinoko = The larva of a bee. Zazamushi = The larva of the insect of a river. The Nagano native often eats this. Kintarou-ame = It is a long candy. A picture is in a section. Omikage = Small icon describing the Buddha. Suppon = A kind of a tortoise for food. Marii and others insists that now is April. It is performed in order to prevent kukuru becoming the "May sickness." They are going to enliven the feeling of Kukuru. However, they fall through. Marii admits at last that now is May. Marii says that they should share pain of Kukuru. Marii declares that She has the "June sickness." They discuss the feature of the "June sickness." gankyou was the "June sickness." They discuss "September sickness." Kugu was "September sickness." Marii looks at a hallucination and she is conscious of the "May sickness." And May is extended. Gogatu Byou = It is an unstable mental condition which cannot be adapted for new environment. Adjustment disorder. If it realizes that a new employee cannot get used to a place of work, symptoms will appear. And that time will be in May. Niramekko = A child's game. A player makes a strange facial expression mutually. It is defeat when laughing. Satuki and May = "My Neighbor Totoro". Satuki is the name in May in Japanese. Green Cat = It is appearing on the manga of Tezuka osamu. Yamashita = That manga assistant does not exist really. That name showed up to the sleep talking of the MAEDAX(assistant of Kumeta). The angle of an eraser = For a child, the angle of a new eraser is a sacred thing. Amado = A traditional shutter. It is a board inserted in out of a window. It is a prolonged travel and a defenses to a typhoon. Probably it is private experience of kumeta. Under a chair = Lyric of the folk song music "Champion". "Alice" is a folk singing group. Probably it is private experience of kumeta. Kugatu Byou = September sickness. Probably, it became difficult for kigu to go to school. It seems that it is probable that Kigu is a school dropout. Last edited by mizuki_tohru; 2012-08-30 at 10:39. I have a question to the song they sang in episode one of the girls who had too much luck, what name is the title? 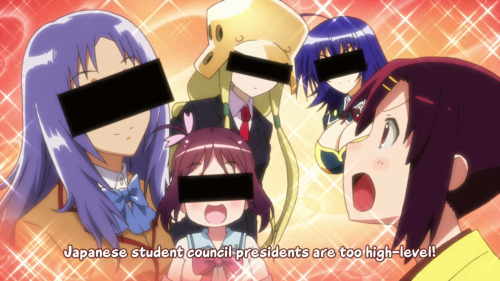 I recognize the President Gokujou Seitokai and Medaka box but not the other two ... the smallest girl is in Saki? Nice find Chiaki-chan, I'm impressed. Here's a little some I've found as well! I think that's Manami from Manabi Straight. Ep 09 is probably the trippiest ever especially the third segment. It doesn't mean not losing steam one bit. I still appreciate the wordplay and talking about relevant issues. I don't know why but I just like Kigu as she slowly reveals her dark personality. Actually there are no characters I hate. They are all pretty much different and likeable. Can't help but feeling sorry for Marie as she is constantly made of a fool and being left out but she is probably the main one that makes the show more enjoyable. Best 40 seconds of my day! The rest of the video looked pretty cool! Can't wait for the full version of the ending to come out. When is that full version coming out? This week? Kigu is apprehensive about a child not being in a seat. They discuss the method of gathering children to a Rakugo hall. Kigu says that a child likes a round thing. They put on round things or try to become round. They say that the Mongolian spot of Marii will be liked by the child. They discuss how Marii takes out the hips on the stage. They say. Except that Marii takes out the hips, there is no method of problem solving. A foreigner visits the room suddenly. A foreigner is convinced that Marii suffered the child abuse and protects. They conclude that a child is not in a seat because it is kidnaped by the foreigner. Chiritotechin = The title of a rakugo program. The man who pretends to know everything is deceived that it is Nagasaki special "chiritotechin"(random name), and eats the rotten tofu. Children whip a naked man. = "KidZania". but, Such occupation experience does not exist. Kigu chan ga kigu siteiru. = Kigu is apprehensive. Kigu chan ga gig siteiru. = Kigu Gigs. Kigu chan ga kifu siteiru. = Kigu donates. Kigu chan ga give siteiru. = Kigu gives up. happy set = McDonald's menu with the toy for children. Comp-Gacha = The mechanism of obtaining a rare card with the combination of several cards in a mobile social game. Cards are sold at a time at the state where the contents are not known. Player tends to consume a lot of money by probability illusion. Round-style charactors = Keroro Gunsou, Mickey mouse, Korosuke(Kiteretu DaiHyakka), Anpan-man. Black boat = Sea shepherd. Ecological terrorist. The song which four sing. = The parody of modern nursery rhyme "Akai kutu"(Red Shoes). 2/3 「上野のぞう」"The elephant of Ueno"
Marii and others goes to Ueno Zoological Gardens. If a flamingo is not near an entrance in Marii, it will say that it is unusual. They are disappointed watching a panda. They are apprehensive about the outflow of the privacy information on a network. Marii says that anybody should fear a bear. Gankyou likes Giraffe. Tetra likes a white bear. Kukuru likes Naked mole rat. They announce the knowledge of various animals. They say the title of a tale with pitiful animals, and cry. The lesser panda which stands straight = Lesser panda "Fuuta" of a Chiba zoo. A bear annihilates a village. = Sankebetu village. Hokkaido. 1914. Kawaisou na zou = Faithful Elephants. Gongitune = Gon, the Little Fox. Koufuku na ouji = The Happy Prince. Taro, Jiro = nankyoku monogatari(Antarctica Story). Chatran = The name at the time of "The Adventures of Milo and Otis." Japanese opening of Milo. Monorail = Ueno Zoo Monorail. The first monorail in Japan. 1957. Marii and others is sleepy. Marii says the proverb "You can go to sleep and wait for a good thing to happen." And Marii goes to sleep. Marii says sleep talking "cannot eat sweets any longer." Although sweets are inserted into the backstage, all the members other than Marii will eat. Marii wakes up. And while she is sleeping, she asks whether there was something good. However, they deny. Marii goes to sleep again and says sleep talking. The opportunity of CM performance visits to all the members other than Marii. Marii occurs and already says that I am not sleepy. Gankyou puts Marii to sleep compulsorily. If Marii says sleep talking, a thing just like that will break out. They put marii to sleep compulsorily and Marii says sleep talking. And a good thing breaks out. However, they suspect that it is too convenient. "Possibly we may be the characters in the dream of Marii." butterfly = "The butterfly dream". A question of Zhuangzi, thinker of ancient China. The patted man = Characters of manga "Oishinbo". Pink sweets = Sakura-mochi. It wraps rice cake including sweet beans in the leaf of a cherry tree. Doumyou-ji Style. The leaf of the cherry tree is processed and for food is possible for it. Gankyou puts Marii to sleep. = The fist of Gankyou has grazed the point of the chin of marii. Reference from manga "Baki the Grappler". Gankyou pets a cat. = In original Manga, Gankyou will fill cats in a sack and will take them. Kukuru swings coin = Hypnosis. She swings coin(5 Yen coin) instead of a pocket watch. Gankyou = Miss Spectacles frame. Back characters are Hanekawa Tubasa(Bakemonogatari), Akizuki Rituko(Idolmaster), Manabe Nodoka(K-ON! 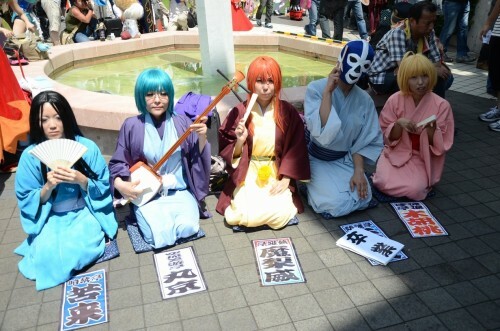 ), and Takatuki Ichika(Ano natu de matteru), from the left. Tetra = Miss "Young-sunday" manga Magazine. Back characters are Birdy(Tetuwan Birdy), Mochiduki Yuuki(Tomehane! ), Oda Mari(Toritu Mizshou! ), and Wakamatu Miyuki(Miyuki), from the left. Kukuru = Miss Chuou-line. JR Chuou raliway line is famous as a place of suicide. All candidates other than Kukuru are already dead. kigu = Miss Tokyo youth upbringing ordinance. Back characters are Mihama Chiyo(Azumanga daioh), Kyon's syster(Melancholy of Haruhi Suzumiya), hiiragi main(Cooking idol I My Mine), and Last order(Toaru Majutsu no Index), from the left. An ordinance exposes a Loli character to a crisis. Masked = Miss Face without make-up. Back characters are Predator, Tiger mask, Kinniku man, and Parman No1, from the left. Sheep = Sheep cooking "Jingisukan" of Hokkaido. Morimoto Leo = Voice Actor. In "Thomas & Friends", he did the substitute actor of the voice of Thomas. His voice becomes sleepy. He is the voice of Shirotsugh of "The Wings of Honneamise." The back cover of a magazine = The advertisement of spell goods. It insists that it can become rich only by having. The prince of Arab = "Zouebi-bin-sultan-al-Tequila". Ebizou. Last edited by mizuki_tohru; 2012-09-05 at 18:18. This episode was a lot easier to figure out than the others, even with my very bad Japanese. I still didn't understand a lot of things: for example, I didn't get why they were talking about children in the first sketch (and thus didn't get the punch line either). The other two were very visual, so I understood the gist of it. I didn't get any of the cultural references, though. Thanks again for your help with watching this brilliant show. September 5th, according to the official site. Just listened to it. So infectious...so effin infectious. You actually listened to the full ending? And what's taking episode 8 and 9 so long? This show needs more love.